A few weeks ago we posted this Creamy Tomato and Basil Soup and I pointed out my reasons as to why soup is awesome in the summer. 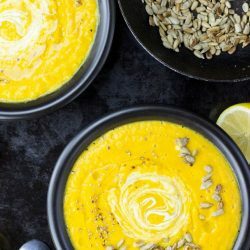 I’m happy to say this Easy Curried Butternut Squash and Coconut Soup is just as awesome any time of year. Pumpkins and squashes are everywhere right now – so here’s the perfect excuse to grab one and eat it! So – over to Kat. It was her task to create a ‘lecker’ (German for delicious!) recipe that sacrificed nothing in terms of taste – only time. Her favourite squash is the butternut – but you can use any of the edible squashes or pumpkins here. This warming soup takes the traditional taste of the squash and enhances the flavour by merging it with curry and using the delicious sweetness of the coconut to offset some of the spice. Simply put, it’s fantastic. And did I mention healthy too? PS – if you don’t have one already then now is the time to invest in a hand blender – they’re soooooo amazing for making soups, smoothies and pancakes – and much more besides! They can really revolutionize a kitchen. It would be silly not to focus on the squash here, so that’s exactly what I’m going to do. It’s a pretty seasonal vegetable so often doesn’t get the coverage it deserves – all the more reason to cram as many dishes in as possible right now! The squash is really high in vitamins A, C and B6, as well as plenty of nutrients and minerals like manganese, potassium and fiber. Combined with the high carotenoid levels, the squash works as an antioxidant, an anti-inflammatory, and is believed to help with type 2 diabetes as well. While more research is needed, early signs also point to a decreased risk of cancer linked to high squash intake, thanks to those antioxidant and anti-inflammatory benefits. (1). It’s not just good for you either – this recipe is completely vegan, meaning no animals were harmed, captured or even involved in bringing this lovely soup to you. 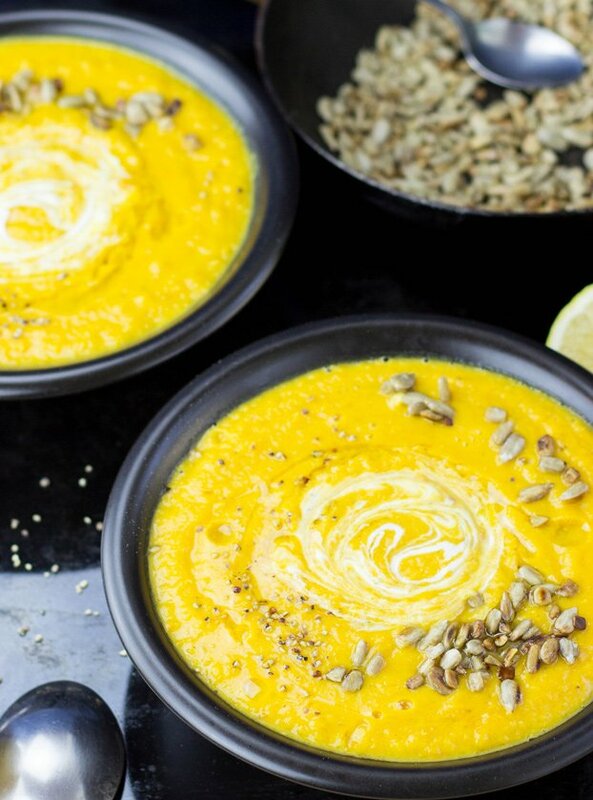 Easy Curried Butternut Squash and Coconut Soup. 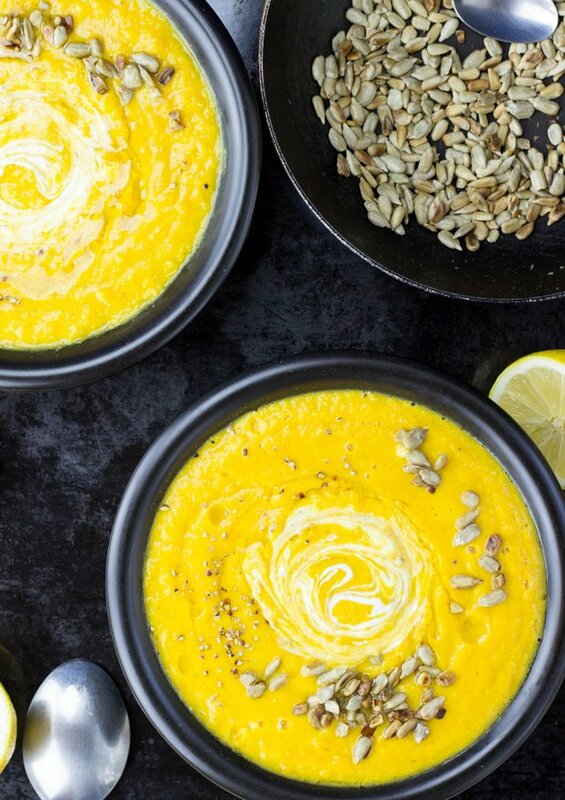 A delicious blend of coconut sweetness and curried squash make this an absolute fall treat. Peel and finely dice the ginger. Add it together with the curry powder to the pot and fry for another minute. Tip in the lentils, vegetable broth, coconut milk and give it a good stir. Bring it to boil, then turn the heat down and simmer for 15-18 mins until everything is tender. If you are using pre-cooked lentils wait until the last couple of minutes to add them and their juice. Use a hand blender and blend it until smooth then season with salt and pepper. Serve with some bread on the side (well if you want to. We won’t force you!) and if you have them, add some roasted pumpkin seeds and drizzle a little pumpkin oil on the top for a much more intense pumpkin taste. IF YOU LIKED THIS RECIPE: and are in a soupy mood then give this Red Onion Soup a whirl. 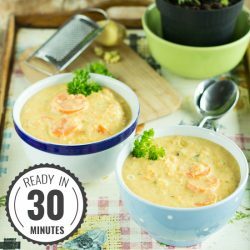 Unlike most onion soups it’s really quick (only 20 mins!) but just as delicious. For something a bit different this Lean Kohlrabi and Carrot Soup is also a must try! I love how easy and quick this comes together!! This bright yellow bowl stopped me in my pinning tracks! So gorgeous and healthy. This is not just an appetizer or side soup, this is a meal soup! With the lentils and the carrots and the squash, sounds wonderful! You need some extras though, like bread and some sunflower seeds or something similar. 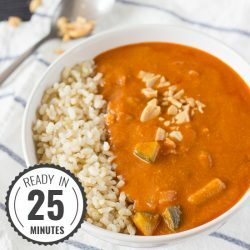 This has so many of my favorite ingredients – squash, lentils, coconut. I’m in! The colour of that soup is just gorgeous and I bet it tastes just as good. I love butternut squash and coconut together! I have the very strong opinion that soup is great any time of year and I grew up in a state that maintained above 100F temperature for most of the year. That being said, soup in the fall is an absolute must, especially when it involves butternut squash! I love the colors and creaminess of this recipes. It’s certainly a must make! It is coming into summer here in Sydney – it is spring but temps up so high – so I won;t get a chance to make this gorge-looking soup for a while. I agree that handheld blenders are a must! well, enjoy spring and summer for now!! Our family loves butternut squash soups, but never tried to add some yellow curry powder in (I was cheking on the ingredients 😀 ) So, it is time to take full advantage of those 3 organic little butternut squashes we bought and make your recipe! Definitely a very good add! Makes it a lot more interesting imho. That is a beautiful bowl of soup! Consider yourself Pinned! And I can’t wait to try it. pumpkin oil? I’m sure it exists, but you wouldn’t need it for this soup. I’m so happy that it’s time to make soup again. This looks so warm and inviting! This soup looks delish! And the basil…. Yes please! And I wanted to give the recipe five stars but it’s stuck at 4! Ekkkk! thanks for the four stars! Thanks Lynday!! Yep, deffo try out some curry powder, I’m sure you’ll like it! I love fall and all it’s flavors, but butternut squash is one of my favorite! Great use of it! 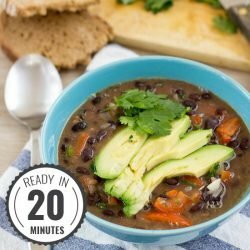 This soup has such wondeful flavors and I think I could polish it off in minutes and I’m in total agreement with you, soup is good year round. I’m always saying that and people think I’m weird when I eat soup in the summer…but dang, if it’s delicious, who cares! Beautiful! But I stopped by the home improvement store to see what they have. Didn’t take a decision though. Whay a lovely soup. I adore butternut squash, and never thought of having it with curry. Great idea! What beautiful soup, it’s so bright, and I bet the coconut makes it really creamy!! This looks very lecker!!!! 🙂 Love the combo of squash and coconut together! This looks so darn creamy – yum! This is awesome, love the wonderful flavor combo! I don’t have a hand held blender but I am thinking I NEED one now – as this soup is GORGEOUS!!! And it’s chock full of some of my favorite orange foods! Love that you combined lentils, and carrots in this butternut soup! Simply delightful! Really?? The hand blender is one of my favourite kitchen tools! Yummy! What a great combo! 🙂 Looks so comforting! OMG!! The colors pop my eye out — in a good way! Anything with coconut in it as a soup is a surefire win to me! hahaahaha, thanks Levan. With eyes the soup wouldn’t be vegan anymore I guess. Just gorgeous!! Awesome pics yall, truly. I love the color, and the curry and other flavors sound just right for fall. Yum! I love the addition of curry to this recipe. Sounds delicious! This soup is incredible! Super easy, super flavorful, and tasty both hot or cold (so yes, you can eat soup in any season – plus it’s too good to put off til colder weather). And it’s really hard to believe so many people haven’t paired butternut squash with curry – it’s a perfect match. The sweetness from the squash compliments the slightly pungent notes of the curry = scrumptious soup. This is simply perfect and you should make it – and devour it! We loved it with a dollop of yogurt and a drizzle of olive oil. Yogurt and olive oil sounds like a great addition. I think I actually have a couple of portions stored in the freezer still, I’ll have to get one out now! Made this for a crowd – 14 servings! Turned out great, thanks for the feature that makes that easy. What was I supposed to do with the ginger? Also, the squash link is broken, I think.